DigitalGlobe's powerful WorldView-3 Earth-imaging satellite blasts off on Aug. 13, 2014. The sharpest-eyed commercial Earth-watching satellite ever built soared into space Wednesday (Aug. 13) on a mission to observe our home planet in spectacular detail. 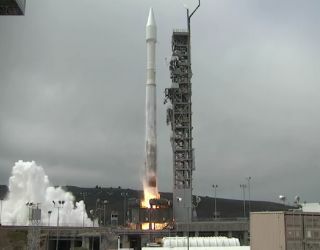 DigitalGlobe's WorldView-3 spacecraft, which can resolve features as small as 1 foot (31 centimeters) across, lifted off atop a United Launch Alliance Atlas 5 rocket from Vandenberg Air Force Base in California at 2:30 p.m. EDT (1830 GMT; 11:30 a.m. PDT) Wednesday. For example, WorldView-3 imagery could help orchard owners keep tabs on their trees from afar, said Kumar Navulur, DigitalGlobe's director of next-generation products. "We can actually tell you, for each individual tree, how healthy it is," Navulur said Tuesday (Aug. 12) during a prelaunch press briefing. "And potentially there are models that can estimate the yield of each individual tree. That's the power of information we are bringing to the table with WorldView-3." Technician working on the WorldView-3 satellite, which Ball Aerospace built for DigitalGlobe. These capabilities should broaden the customer base for Colorado-based DigitalGlobe into areas such as oil and gas exploration, forestry and agriculture, he added. "We don't play that much in that area today, but I think WorldView-3 will enable us to start accessing those markets," Navulur said. WorldView-3's high-resolution prowess approaches what aerial photography companies are currently offering, said Jeff Dierks, WorldView-3 program manager at Ball Aerospace, which built the spacecraft for DigitalGlobe. "A WorldView satellite has a unique capability to basically image anywhere in the world within a day. That's tough to do with an airplane," Dierks told Space.com. "So a company like DigitalGlobe sees an almost limitless market … as they get getter resolution and better imagery." An instrument aboard WorldView-3 called CAVIS (short for Cloud, Aerosol, water Vapor, Ice, Snow) will help the satellite get a sharp view of the ground despite the presence of dust, soot and other gunk in Earth's atmosphere, Dierks added. "What you're actually doing with CAVIS is viewing the column in the atmosphere that you are imaging down through, then 'true[ing] up' the color bands of images," he said. "As some of my DigitalGlobe team colleagues say, we can make the Ferrari look red like it’s supposed to." WorldView-3, which was delivered to a polar orbit 383 miles (617 kilometers) above Earth's surface, joins five other Earth-observation satellites in the DigitalGlobe constellation. The keenest eyes among those other five belong to GeoEye-1, which boasts a resolution of 1.3 feet (41 cm). WorldView-3 will be able to image 263,000 square miles (680,00 square km) per day, while the entire fleet's capacity is 1.54 million square miles (4 million square km) per day — nearly half the area of the continental United States, DigitalGlobe representatives said. "It's all about seeing a better world," Navulur said. "We want to enable our customers to see the Earth clearly and in new ways, and make the Earth a better place." WorldView-3 weighs 6,200 lbs. (2,812 kilograms) and measures 19 feet tall and 23 feet wide (5.8 by 7 meters) with its solar panels deployed. A series of thruster and instrument checkouts will take place over the next four weeks, and a data-certification process will follow to make sure the satellite's imagery is up to snuff. "That is all planned to be done by about three months after launch," Dierks said. Given that all goes well, "then we kind of take a step back, and DigitalGlobe takes over." Leonard David, Space.com's Space Insider Columnist, contributed to this story from Vandenberg Air Force Base. Follow Mike Wall on Twitter @michaeldwall and Google+. Follow us @Spacedotcom, Facebook or Google+. Originally published on Space.com.